Self-care consists of a wide range of activities that are universal in their importance to health, but which have to be tailored to an individual’s circumstances. Important steps in the development of self-care will be its measurement in individuals, and (in future) in populations. However, the use of self-care metrics by individuals is not widespread, with the notable exception of people who are trying to lose weight or improve their fitness. A holistic measure of an individual’s self-care status and the identification of priority areas for behavioural modification can provide useful base data and incentives for personal change. Data derived from measurements of self-care practices would be valuable in addressing these challenges, at an individual and population level. 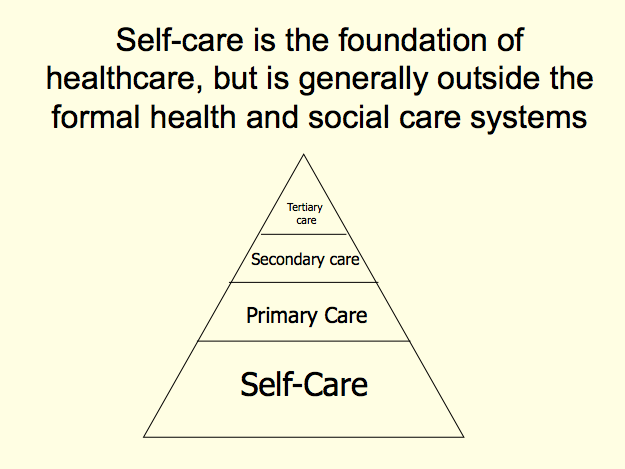 Fundamentally, self-care is a relatively new concept, and there is a strong opportunity and need to ‘systematise’ it. Measuring how the different elements of self-care operate independently and interdependently is an important step in a ‘systems approach’. Measures which define health norms. These are the normal population ranges of key health norms relevant to self-care (e.g. body mass index or calorie intake), split by gender, age etc. These norms represent the comparators and potentially some goals, for individuals to compare themselves with. Measuring change in myself. The object of self-care is for individuals to make adjustments to their daily practices. In this it will be helpful to record self-care activities, and outcomes. Each of these measurement areas can be mapped across the 7 pillars to give a consistent overall framework of measures. The 7 pillars include different types of situation and activity – cognitive, behavioural and physical.